Almost 5 years ago, I built a set of bunk beds for my kids. Recently, I finished another bed, this time a single, stand-alone unit, in cherry. This bed shares many similarities with the bunk beds, including the basic dimensions (all use standard twin size mattresses) and the rail attachment and mattress support structure. The main difference lies in the height of the mattress used. The bunk beds used a single mattress and bunky board to limit the overall height. This bed uses a mattress and boxspring thus increasing the height by some 6 to 7 inches. Accomodating this change meant lowering the mounting height of the side rails and raising the height of the headboard, footboards and bed guard. This is a brief description of the bed, with minimal information. 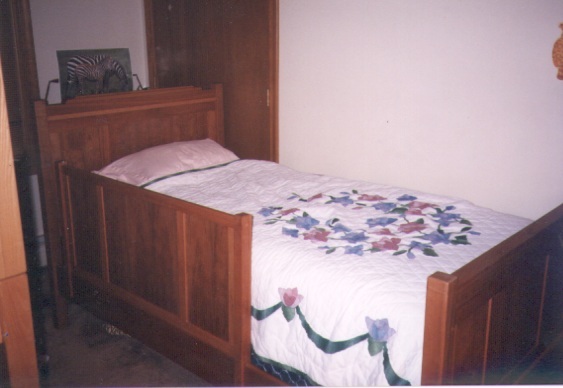 The goal is not to provide a play-by-play of the bed, but rather to describe what it is so that the average woodworker can get an idea of what was done. It is assumed that anyone interested in reproducing a similar bed would have knowledge on basic bed design and design something to his or her liking. The above referenced bunk beds also offer information that apply to this bed and provides a starting point for the novice reader. 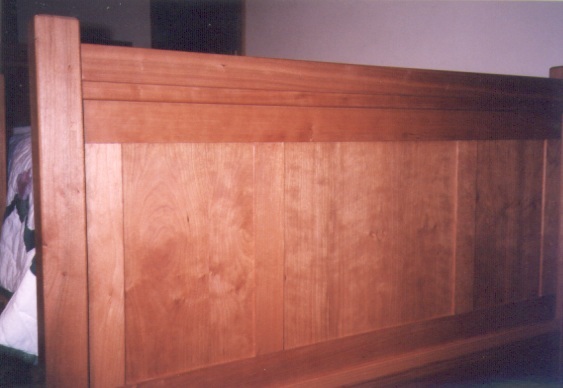 The main rails on the bed are made from 4/4 rough cherry, planed down until all four sides are parallel and smooth. The resulting thickness is slightly over 3/4 inch while the width is about 6-1/4 inches. The length is 76 inches, just as with the bunk beds. The same metal connectors are used to mount the rails to the head/footboards as were used in the bunk beds. When attached to the head/footboards, the bottom of the rails are about 7-1/2 inches off the floor. The top side of the rails have a 1/4 inch roundover applied to both the inside and the outside of the rail. It is necessary to soften the rail's long edges since little feet will often step on this edge. A 3/4 x 1 inch cleat is mounted along the bottom inside edge of the rail which in turn supports four 3/4 inch thick stretchers spanning the width of the bed to support the boxspring (these are not shown in the pictures on this web page). The bed is shown here with the guard. Each of the four corner bedposts is roughly 2-1/8 inches square. They measure 44 inches high on the headboard and 34 inched high on the footboard. Their actual size was dictated by the stock I had on hand. The span between (and not including) the posts is 39 inches (as with the bunk beds). The bottom of the main headboard structure is 18 inches off the ground leaving a large gap to the floor. 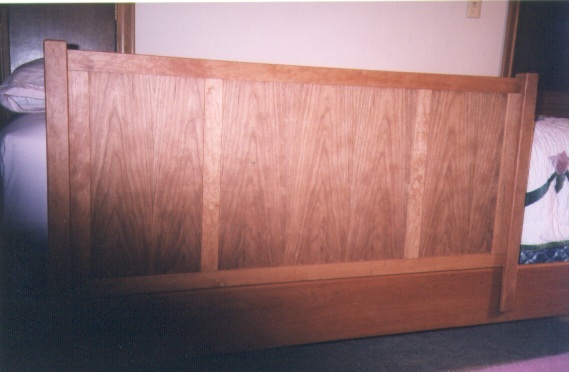 Since it was assumed that the headboard will be placed against a wall thus hiding this gap, a lower stretcher about 8 inches off the ground was added to provide added stability. There are three plywood panels in the middle of the headboard. The very top has some decorative trim work to differentiate the headboard from the footboard (aside from height). 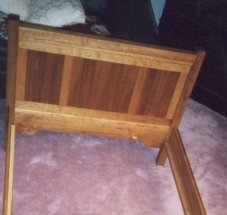 There is no lower stretcher on the footboard, nor is there any detail on the top edge. There is however, some additional detail on the lower edge as can be seen on this image. Pinned mortise and tenon joinery is used throughout and care was taken to account for wood movement. All posts edges are chamfered with a hand plane and further softened with sandpaper. Since this is a large bed in comparison to the occupant, a bed guard was added. The guard resembles the head/footboards in general appearance and slides onto the main rails. The end posts on the guard are 25 inches high, 1-1/2 inches wide and 1-3/4 inches deep. Its overall width, including the posts, is 46-1/8 inches. When installed, the posts are 20-1/.4 inches above the rails. Note that the guard is not strong enough to support large weights from above or from the side. It will however keep a sleeping and tossing child from falling down. When no longer needed, it will likely be moved to the wall side of the bed. All surfaces were sanded to 400 grit, and finished with Danish oil. A topcoat of wax finished the unit.